Board-marked concrete walls frame pool views from AT House - Dr Wong - Emporium of Tings. Web Magazine. 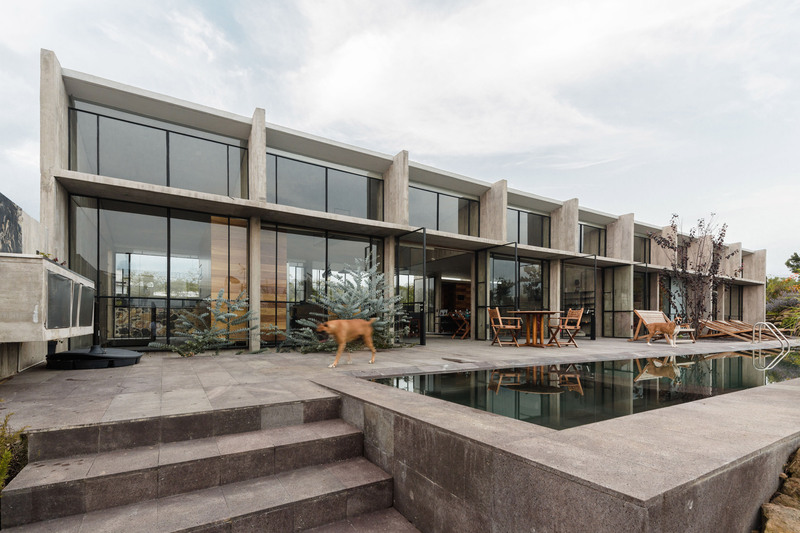 Ten glazed sections divided by board-marked concrete walls are lined up to form this long Mexican house, designed by architect Laurent Herbiet. 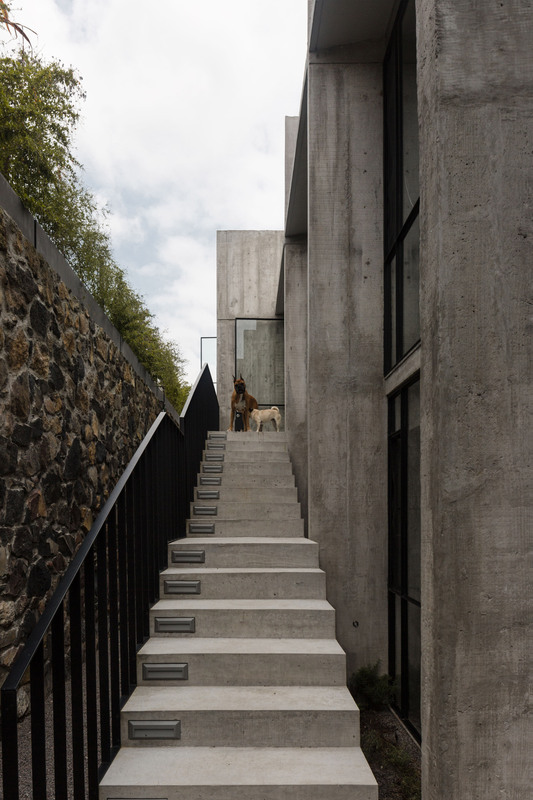 Herbiet, who runs the Mexico City-based studio Hrbt, completed AT House at the top of a hill in Oaxtepec – a town in the north of Mexican state Morelos – for a couple with dogs. 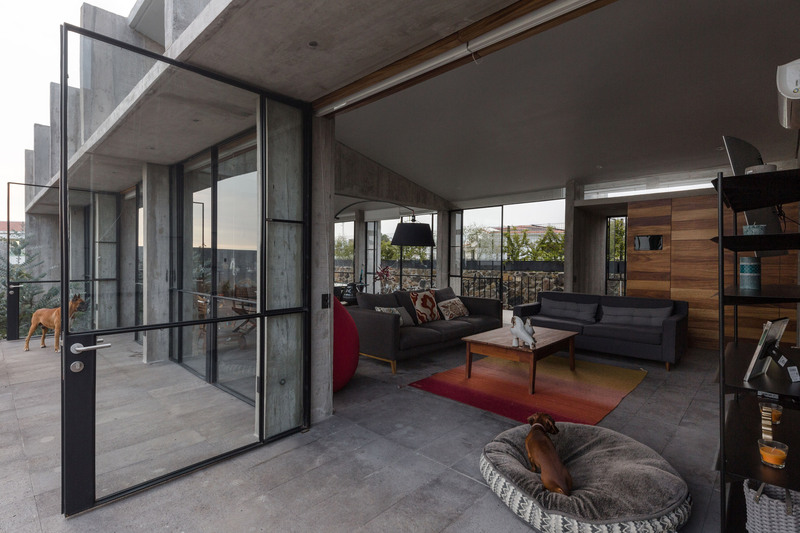 The architect gave the 320-square-metre residence a slender shape. He placed large expanses of glazing on the longer southern wall, in order to make the most of the elevated vantage of views to a valley at the rear. The glazing, which also runs along the northern side, slots between shorter, perpendicular board-marked concrete walls. 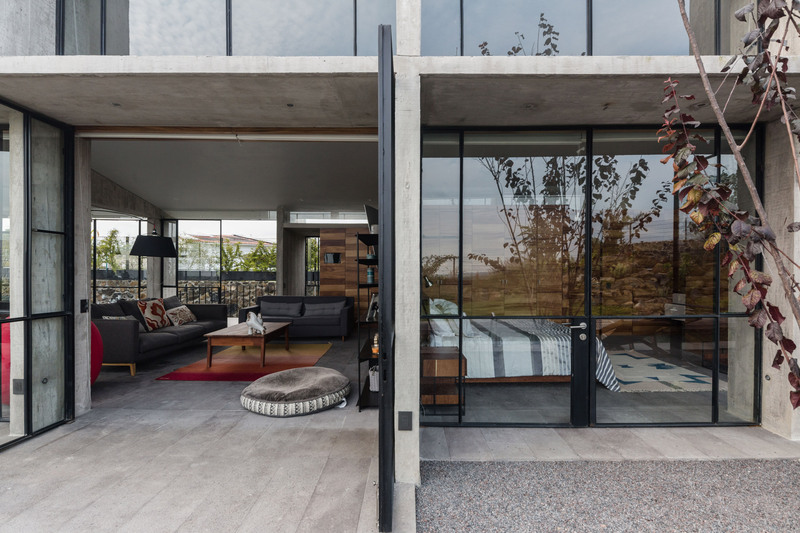 The concrete, textured by the imprints of wooden boards, is intended block views from the street on the eastern side and neighbouring properties to the west. 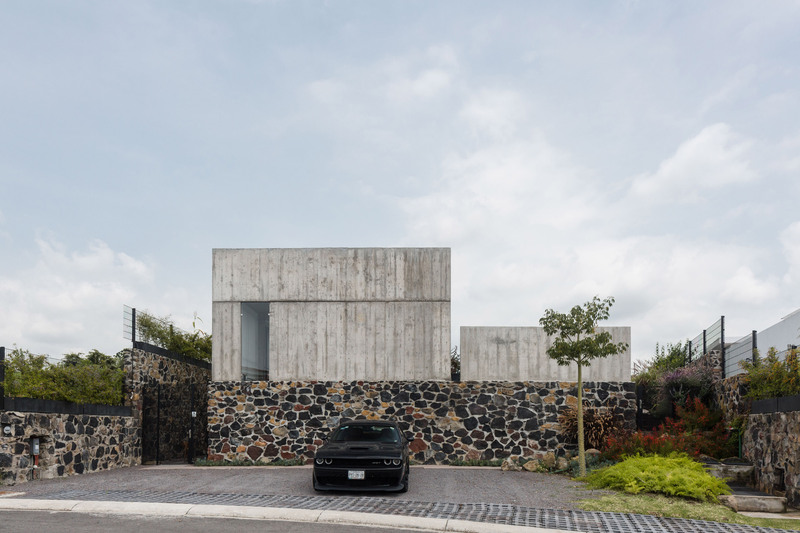 “The house is located on the highest point of the hill, it gazes mainly inward, to avoid the neighboring street, and a series of greenery filters views of the Oaxtepec Valley, the fields and the sky,” said a statement from Hrbt. 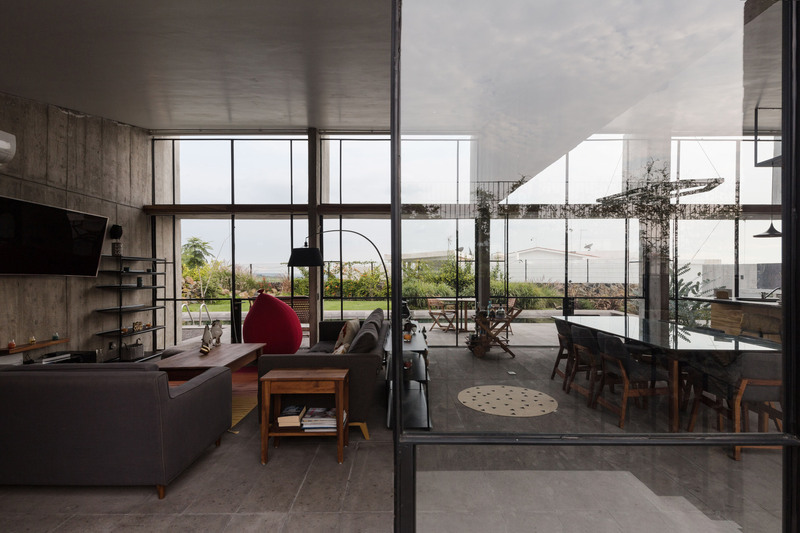 Pairs of glazed doors run along the south side, to open all the interiors onto the terrace and the narrow pool that runs parallel to the house. 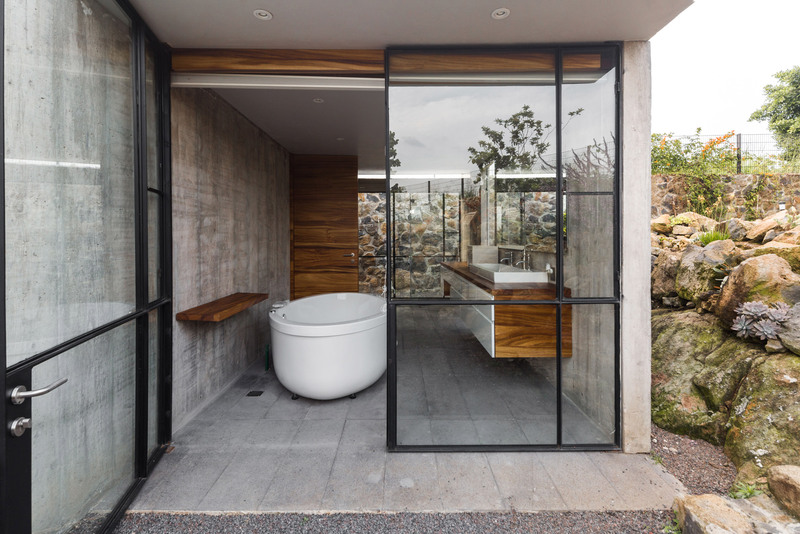 As well as providing a connection between the two areas, the glazing is also intended to reflect the sunlight onto the pool’s water and heat it naturally. The mono-pitched concrete roof above slopes up from the northern wall, creating space for another window on the top of the southern wall. This upper level slightly protrudes to offer shade from the strong sunlight to the floor below. A narrow corridor runs along the back to adjoin each of the functions within the house, which are placed side-by-side to follow the modular layout of 10 segments. Playing with this layout, the architect left the first five segments open-plan to merge the kitchen, dining room and lounge. 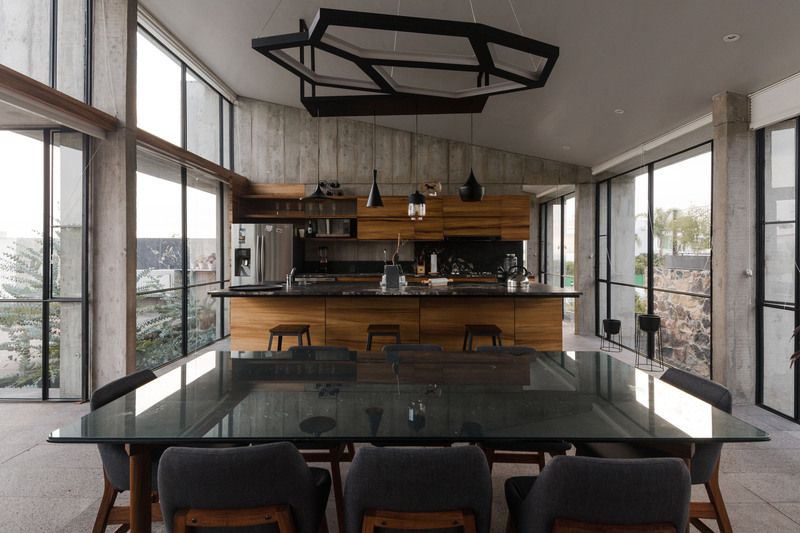 Among the main features in the space are the wooden kitchen cabinetry and a dining table in the middle, which has a reflective with a sculptural light hanging above. The guest bedroom is placed in the volume next to this, with an en-suite bathroom. 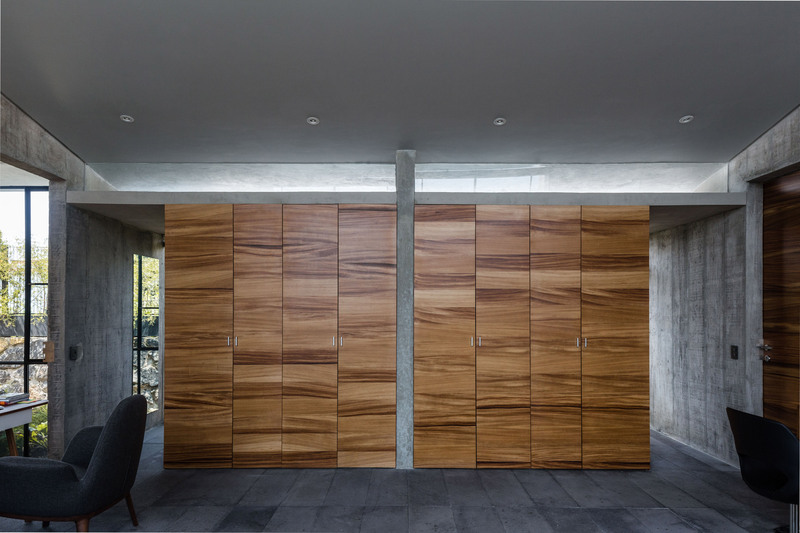 The end of the residence is given to the master bedroom, which includes a dressing area and a private ensuite. 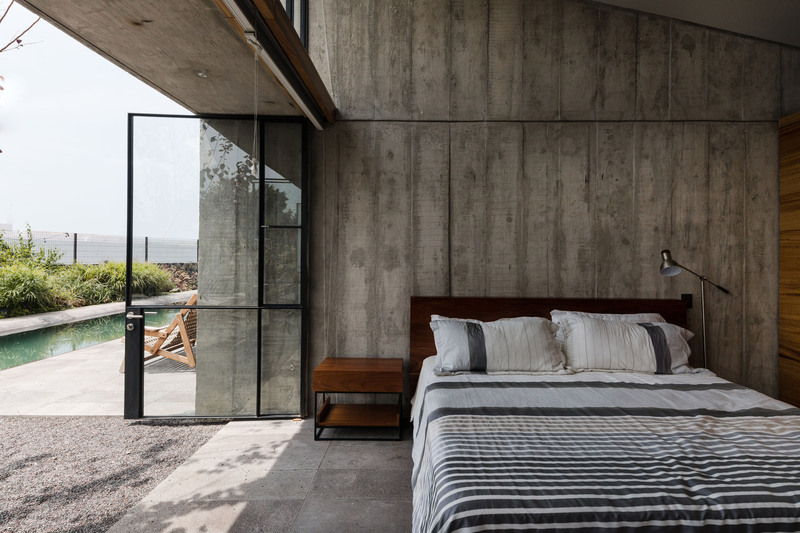 Throughout the residence, the rough concrete ceiling and walls are left exposed, complemented by large concrete tiling on the floor. As with the main living space, additional accents in the bedrooms are provided by the woodwork, including the bedside tables and shelving. Outside, the deck is furnished with a wooden dining table and a series of loungers for sunbathing. There is also a bed of dark grey gravel in front of the master bedroom and a number of large trees. 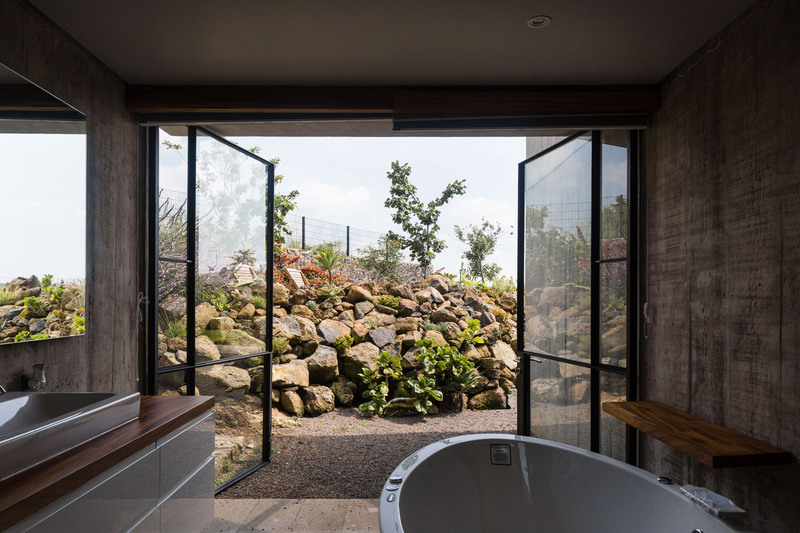 Other features include a series of kitchen cabinets to prepare food when dining outside, and a rockery covered with local planting and succulents to absorb rainwater. This wall is made of rubble and masonry sourced when the site was excavated during construction, to level the ground and create a small basement level. Accessed by a staircase behind the kitchen, this lower level is occupied by a second guest bedroom and mechanical room. 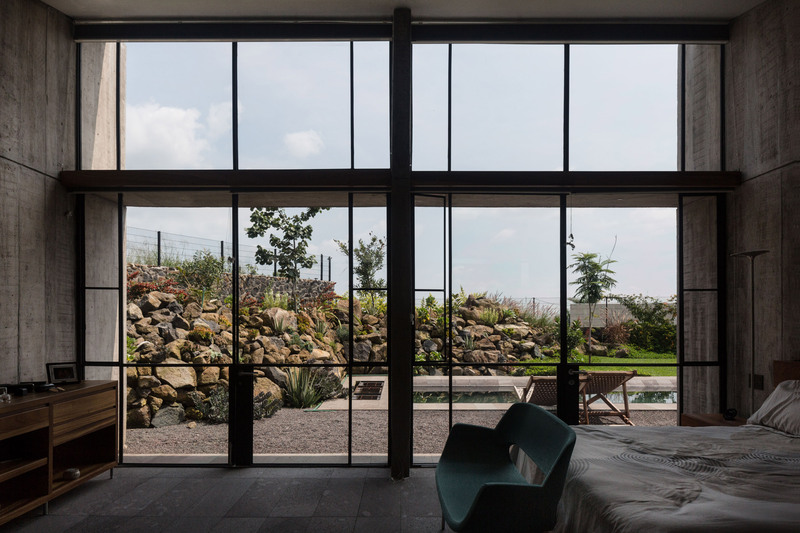 Many aspects of Herbiet’s design for the residence are intended to take into consideration the climate of Oaxtepec, which includes long spells of both dry and rainy weather. Fifteen solar panels are fitted on the 220-square-metre surface roof, with plenty of room for more. Rainwater is also collected on the rooftop in cast-in concrete pipes, before being filtered system and then stored in a tank placed in the basement to be used for household services. “By means of user friendly, renewable and affordable technologies, AT House reduces its power, energy and material requirements to offer a comfortable, cheap to run and beautiful house, in contact with nature and the elements,” said the studio. 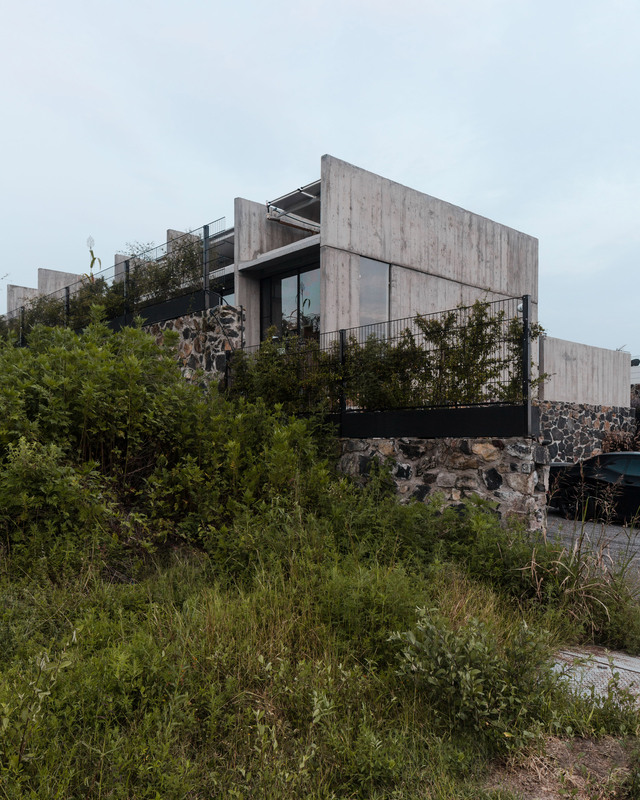 Also in Mexico, architects Fernanda Canales and Claudia Rodríguez built a house comprising nine dark-coloured blocks circling a forest clearing. Photography is by Onnis Luque. 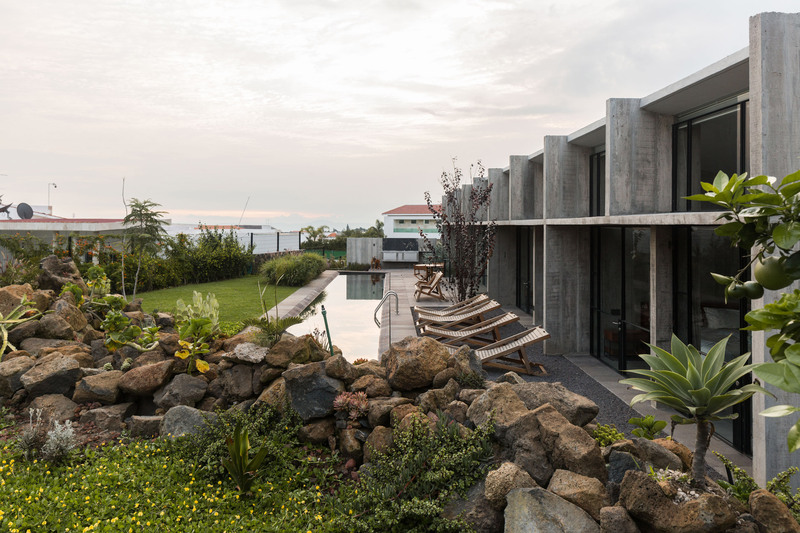 The post Board-marked concrete walls frame pool views from AT House appeared first on Dezeen. Next PostNext SickKids VS: For all the moms who ask for nothing.